A startup by the name of Nikola Motor Company has emerged from the shadows to unveil two concept electric vehicles that could have a major impact on their respective markets... assuming of course that they actually make it to market one day. The Nikola One is an electric semi-truck with a striking look that resembles something you’d see in a Transformers movie. 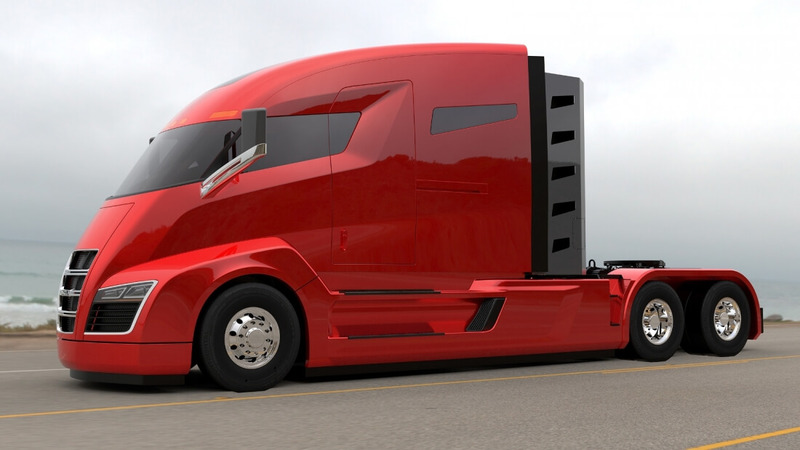 The proposed cargo hauler, which will utilize a natural gas-powered turbine to charge its 320kWh lithium-ion battery while driving, is capable of generating 2,000 horsepower and 3,700 foot-pounds of torque with an estimated range of 1,200 miles. Torque is paramount in a semi and having all of it on tap almost instantly means it can accelerate nearly twice as fast as a standard semi, the company claims. With a full load, the rig will reportedly be able to accelerate from 0-60 MPH in just thirty seconds. The One also features 6x6 regenerative braking which, when combined with the air disc brakes, allows the semi to stop up to twice as fast under full load compared to any other truck on the market. Nikola further claims the One’s aerodynamic design plus the fact that it weighs roughly 2,000 pounds less than a standard rig makes it more capable and efficient than the competition. That certainly seems plausible if you were to remove the massive diesel engine that powers today’s big rigs. The Nikola Zero, meanwhile, is a utility task vehicle (UTV) that largely resembles a traditional side-by-side. The fully-electric vehicle packs a mind-numbing 520 HP and 476 ft. lbs. of torque that’d propel the four-seater from 0-60 MPH in just three seconds (that's in the supercar range). Other goodies include a 50kWh battery, full-time all-wheel drive, Beard seats with 4-point safety harnesses, 20 inches of suspension clearance with 14.5 inches of ground clearance, 32-inch tires, 14-inch disc brakes, 10-degree rear steering, double winches and of course, an IP67 rating for the electric motor and gearbox. Nikola Motor says it’ll be good for up to 150 miles of range on a full charge which can come courtesy of a wall charger or 600w solar roof panel. Four cameras mounted on the perimeter of the UTV provide visibility to two 7-inch displays and a single 10-inch display. Named after inventor Nikola Tesla (I’m sure Tesla Motors is thrilled about the name choice), Nikola Motor Company’ creations are ambitious if nothing else. Tesla has proven that modern electric vehicles are plausible and can look great but getting to this point has been an incredibly costly affair. Funding alone could very well sink the startup before anything ever hits the market. The EV company is now accepting reservations for both vehicles. You’ll need to drop just $1,500 for the Nikola One which will come in at an MSRP of $375,000 or $750 to reserve a Zero UTV that starts at $42,000. Nikola says the first 5,000 people to reserve a One will receive free fuel for a million miles while the first 5,000 Zero reservations will get an instant $5,000 dealer discount. Nikola Motor Company plans to demonstrate the first working prototypes to the public later this year.